Monsieur Pierre du Vallon—a huge man with broad shoulders and a wealth of red hair and beard—knew that his besetting sin was vanity. Oh, he wouldn’t put it that way, though his friend Aramis often put it just that way. If pressed, Monsieur du Vallon, whom the world had known for years as the Musketeer Porthos, would say that he knew himself to be a well set man, twice as broad, twice as strong, twice as valiant as all others. Pushed further, he might admit he had a fine taste in clothes and that his swordplay was the best ever seen. This he did not consider vanity, as such, but a mere statement of facts. It only seemed to him odd that most people refused to acknowledge these truths. That this made him particularly vulnerable to the admiration of those who did know Porthos’s true worth, Porthos would be the first to admit. It had been Aramis’s admission that Porthos was the best fencing master in Paris which had caused Porthos to try to teach the effete young man—then known as Chevalier D’Herblay—how to fence in time for an impending duel. It had, however, been Porthos’s real worth as a teacher that had allowed Aramis to kill his opponent in that duel—in direct violation of the King’s edict against dueling. And this in turn had forced both D’Herblay and du Vallon—his second in the duel—to go into hiding, as Aramis and Porthos in the King’s Musketeers. None of which, Porthos thought as he stood in the middle of the vast, empty room, explained why he found himself now waiting for a student who was a good two hours late. The student, Guillaume Jaucourt had approached Porthos some weeks ago and had told Porthos that he knew Porthos’s secret. He knew Porthos’s true identity. Porthos had shrugged this off, because who would listen to a son of minor nobility, a young boy just turning twelve? And besides, Porthos was fairly sure that the King and Monsieur de Treville, captain of the Musketeers, knew his identity. He was fairly sure, even, that it was an open secret in the court. It was only that—Porthos thought—as long as no one could prove it, the King didn’t need to punish Porthos for du Vallon’s trespass. But then the boy who had begged Porthos to teach him fencing—had said that du Vallon had been universally acknowledged as the best fighter and sword master in all of Paris—which is to say in all the world. Porthos’s inability to resist hearing the truth thus stated had made him agree to teach the boy to fence. And he’d done just that for weeks. The youth—a stripling with promise of future sturdy manhood—had proven deft with the sword, capable of parrying and thrusting with the best of them, and with fast and deceptive enough footwork to rival Porthos’s own. Not that Guillaume was ready to fight duels. He was all of twelve, with dark red auburn hair, gray eyes and an intent, serious expression. He’d listened most attentively to Porthos’s instructions not to duel. After all, the Musketeers didn’t take boy recruits. But he’d proven a willing student, ready and capable of great work. He’d always been on time. Punctual like an Englishman. It was only today that he was late. Very late. And Porthos found himself worried against his wishes. The room where Porthos stood was on the bottom floor of the lodgings he rented. Situated at the back, it faced the garden and the back gate. It had been—in the distant past when the house had been built and when this area of Paris had still held fields and farmers—the loggia of the building, the place where harvest was brought in and fruits and vegetables stored. Vast and cool and windowless, it got all its light from the door when it was opened. Why the landlord hadn’t converted it into rooms to rent, Porthos didn’t know nor care. But when he’d found out that this room sat here, unused, at the back and bottom of the house, he’d made it his business to ask the landlord for the use of it. Given the musketeer’s size and girth, few men of normal size thought to say no to him. And so Porthos, and his friends—Aramis, Athos and D’Artagnan—had for some time commanded the use of this room for their sword practices. Musty and smelling of long-disuse and dried apples, it was nonetheless broad enough and secret enough that they could have mock duels without calling on them the wrath of the Cardinal’s Guards with their fanatical enforcement of the prohibition on duels. And here they didn’t have to listen to comments and heckling from other Musketeers as they did when they practiced at Monsieur de Treville’s residence. Aramis had snickered and said it was vanity that had led Porthos to line the narrow space with many mirrors. And though Porthos felt aggrieved by the accusation, he did not know how to defend himself. For there was this in Porthos, able, accomplished giant that he was—words scared him more than any foe whom he could meet in field of battle or duel might. Words slipped through his mind, where sounds and sights and senses resounded as clearly as church bells on a silent summer afternoon. So he lacked the words to explain to Aramis the mirrors were there for two reasons—one to propagate what little light came through the open door. And another, to allow him to study his movements and those of his opponents when they practiced swordplay. If it allowed him to examine the excellent cut of his doublets, the fullness of his hat plume and the way his broad, ankle-long venetians molded his muscular legs, so much the better. But now he looked in the mirror and did not see that. Instead, above the worn linen pants and tunic in which he’d dressed for the lesson, he saw a pale, intent face with dark blue eyes staring in puzzled wonder. And this, he told himself, might not mean any more than that the boy had been stopped by a zealous father or an officious mother. From things the boy hadn’t said, from hints and notions and occasional mentions of his family, Porthos understood they didn’t mean for him to learn to fight. Why, Porthos couldn’t hazard to guess. Who understood parents, anyway? Porthos’s own father hadn’t wanted his son to learn to read, being fully convinced that learning to read would soften and feminize his huge son. Porthos hadn’t been able to master reading until he’d come to Paris in search of his fortune. Perhaps Guillaume’s father intended the boy for the church and perhaps he subscribed to the—not particularly popular—notion that churchmen should be men of peace. In which case, Porthos should introduce him to Aramis, who had once been a seminarian and who still considered himself in training for the habit, but who could wield the sword with murderous skill and intent. Still, Porthos told his very worried-looking reflection— Guillaume’s absence meant nothing. Absolutely nothing. Just that his family had caught him sneaking out of their lodgings. Or perhaps that the boy had changed his mind about wanting to learn swordplay. Which meant Porthos should never have agreed to teach him in the first place. Or not for free. At least if he’d demanded money the boy might have taken the whole thing more seriously. The Porthos in the mirror ignored these rational reassurances. He bit worriedly at the corner of his lip. Porthos grumped, and smoothed his mustache out of his mouth and glared at his reflection. The reflection glared right back, his eyes full of worry. Worry for what? The boy was fine. He’d missed one lesson. What was there to that? Porthos’s thick fingers pulled and stroked frantically at his luxuriant red mustache. What was there to it? Only this. That the boy had been so intent, so decided, so capable of hard work that Porthos refused to believe he would give up on his lesson so easily. And because Porthos had made sure the child understood that he wouldn’t continue teaching him unless he showed for every lesson punctually, Guillaume would know that this one miss could mean the end of his apprenticeship. The Porthos in the mirror looked triumphant, justified in his worry. And Porthos stomped. God’s Blood! So, the boy was late. And so, perhaps something had happened to him. What was Porthos to do with that? He was not the boy’s father. And on this there was a sharp feeling of something that inarticulate Porthos would never find the words to describe. He had the sudden forlorn feeling that, had life been different—had his family lands not been poor and forsaken and inhabited by peasantry just as poor and forsaken; had his father known how to plant the land with newer, more fashionable crops—he would now be married and have half a dozen children clustering around him. The longing for that life that had never happened surprised him. He would have liked half a dozen broad-shouldered sons, clustering around him, learning sword fighting and horseback riding from him, and admiring their father’s strength and courage. He growled at the Porthos in the mirror, whose image was giving him these ideas, and removing his hat, flung it with force to the dusty stone floor of the room. Oh, curse it all. God’s Death! What was he to do about this? And what did Guillaume have to do with these children that Porthos had never had and would probably never have? What the frowning, worried reflection seemed to tell Porthos was that Porthos had enjoyed Guillaume’s company as if Guillaume were a replacement for those sons Porthos would never have. And the boy had responded to Porthos that way too. He’d listened to him with full attention and learned to repeat his movements faultlessly. No. Nothing short of a major disaster would have prevented such a determined and cunning boy from coming to his lesson. Slowly, Porthos picked up his hat and dusted its plume. The devil of it was that he had no idea at all where the boy came from. Oh, the child had told him his name, but Jaucourt was not a name that Porthos knew. It must be the name of a family recently come to Paris from the provinces and probably renting lodgings meaner than Porthos’s own from some landlord, in some part of town. What part of town, only God himself knew. That is, if He had paid any attention to such an unimportant matter. Porthos hadn’t bothered to find the family home because the child was clearly coming to his lessons in secret—but assiduously. As a huge sigh escaped his lips, Porthos wondered how to track someone—how to find them and discover if a mishap had befallen them when you didn’t know where they were coming from or what their route was? He walked to the door and looked down at the garden, slumbering in the early morning cool soon to turn into heated midday of very late summer. Very well. So, he knew that the child came in through the garden gate at the back. Without much thought, without much more than a need to move, a need to do something, Porthos walked impatiently down the garden path, past the kitchen garden with its parched-looking rows of herbs, and down, past an area where trees shaded the path, to the unpainted, rickety gate at the back that had been barely visible from the practice room’s door. He opened the gate, satisfied at its shriek, and looked out at the broad plaza back there. Back here, truly, you wouldn’t know you were in Paris. This garden gate opened to a bucolic landscape—the back of several houses, narrow alleys running between the tall walls that encircled gardens. There was a vague scent of roses in the air, and Porthos remembered that Guillaume had come in yesterday with a rose in his cap—a bright red rose with wide-spread petals, of the sort that often grew along the lanes of Porthos’s native village. Guillaume had said they were flowering just up the lane from here. Like a dog on the trail, Porthos followed the strong scent of roses across the plaza. Peering down a lane, he saw a straggle of nearly wild roses pushing over the top of a rickety stone wall. The roses were exactly the same color and look as the one Guillaume had worn. Convinced he at least knew the boy had come this way, Porthos trotted down the narrow alley. It was barely wide enough for his shoulders and it was hemmed in by two very long, very high walls, both of which, from the noise and talks emerging from beyond them, probably hid communal gardens shared by several rental houses or houses filled with rental rooms. At the end of the alley, another alley ran across it, forming as if the top of a T. Porthos frowned. Right or left? If he went right, and the boy was coming in, late, from the left, he would miss him completely. And then Guillaume would wonder where Porthos had gone. What had Guillaume said about his route here? What that might give Porthos a clue as to where the boy came from? Vaguely, because he hadn’t been paying much attention, Porthos remembered that Guillaume had complained of the heat of a smithy he passed on the way here. It had been a couple of weeks ago, when August was at its hottest, the sun beating Paris to a red heat, as though it had been metal laying on Vulcan’s own forge. And now straining his ears, Porthos could hear as if hammers on metal. From the right. He hastened down the right side of the alley, till he came to a busy forge. It took up the bottom space of a tall house, but it had at least three doors, all of them open to the day. There were anvils with sweating men pounding on them, and there were boys working frantically at the bellows, and there was a nobleman—from the attire—in a corner, holding a nervous white horse that was being shoed by two muscular young men. Porthos bit at the corner of his mustache. So—there was a forge. Pray heaven it was the right one. Now . . . from here . . .
Something about a fishmonger’s. Just down the street. Porthos’s nose led again, till he came to a fishmonger’s in a huge plaza. From there so many roads led on that Porthos found himself quite at a loss. Until he remembered Guillaume admiring Porthos’s new boots and saying that he’d seen some at the cobbler’s on the way here, but that his father would never give him money for them. Peering down the streets, Porthos found the cobbler’s. From there, he remembered the boy making some mention of a tavern at the end of an alley and how Musketeers sometimes drank there. The boy hadn’t wanted to discuss the tavern much, but he’d told Porthos it was the Hangman. From Porthos’s foggy memories of being led by Athos to every tavern in Paris, when Athos was in one of his drinking moods, Porthos found the alley that led to the back of the Hangman. He walked down half the alley before he saw the boy. At first, he thought it was just a pile of clothes, though the clothes were purple velvet and the hat had a plume uncommonly like Guillaume’s. It was crumpled against a wall, on the muddy ground of the alley at the back of the tavern. But when Porthos approached, his big feet raising dull echoes from the packed dirt, the bundle near the wall stirred, the hat went up, and a flushed, haggard face with bulging blue eyes stared at Porthos. The boy looked at Porthos. His eyes were wide and shiny, but didn’t seem to see him. “The angels,” he said. “The angels flying.” He was very red. “Oh, here, boy. How much did you drink?” Porthos asked, feeling annoyed with Guillaume and with himself. It was clear the boy had got hold of wine somewhere. Clumsily, Porthos reached for the boy and tried to make him stand, but he only flopped around like an ill-stuffed rag doll. Guillaume’s arms moved, outward. “Flying,” he said. And here, Porthos was momentarily confused. The boy was flushed, and he acted drunk, but there was no smell of alcohol about him. Could he have gone mad? Or was he ill? “Here,” Porthos said, trying to support the boy as he would one of his comrades when wounded or drunk. But the boy twisted and convulsed. Porthos, despairing of holding him firm, finally lifted him up and threw him over his shoulder. He would take Guillaume back to his lodgings then call on Aramis. Aramis knew nearly everything and everyone. If the boy was sick, Aramis was the best person to find the boy’s family. Sick or mad, they would need to know. These words, as they walked through narrow, darkened alleys made the hair at the back of Porthos’s neck stand up. It was as if the boy were talking of some reality only he could see. Suddenly he stopped and convulsed, then again. There was a sound like a startled sigh. It didn’t surprise Porthos when he put the boy down on the floor of the practice room to find the boy had died. Still he checked, with a finger laid against the boy’s neck, a hand searching for a heartbeat that wasn’t there. At long last, he stood and slowly removed his hat in respect for the small corpse with his wide-open eyes, his expression of surprise. Guillaume Jaucourt was dead. Who knew from what? Who knew how to contact his family? Who could break the news to them? And—if murder had been done—who could ensure the killer was found? Athos, Aramis, D’Artagnan. The names of his friends, the other three of what all called the four inseparables, came unbidden to Porthos’s mind. He never doubted it. Slamming the hat back down on his head, he left the practice room, closing the door gently behind him. Athos, noble as Scipio and twice as wise, Aramis, learned in theology and the labyrinthine ways of Parisian society, D’Artagnan the young, cunning Gascon. Those three would know how to help Porthos seek justice for his apprentice. The two men looked as different as two men could look. Early morning, on the marble staircase that led from the antechamber of Monsieur de Treville to his private office, they fought a mock duel for the right to ascend the staircase. Defending it, on the higher step, was a dark-haired, pale-skinned man. His features would have made a classical sculptor weep and his zeal-burned dark blue eyes could have graced a mystic or a saint. But he stood, sword in hand, with the adept grace of the veteran duelist. His tight-laced, Spanish-cut doublet and knee breeches, now more than a decade out of fashion, lent him a timeless air and also the air of one who would have control over his own body. His name was Athos and had been Athos ever since he’d joined the Musketeers to hide who knew what shame or disgrace. Throughout Paris it was rumored that he came from the highest nobility and that his crime was such that, if named, it would cause the heavens to shudder. The rumors were almost right. Before assuming the musketeer’s uniform as other men take the penitent’s cowl, the man had been Alexandre, Count de la Fere, descended from one of the oldest and most honored noble houses in the Kingdom. And the sin for which he sought to atone was the execution of his Countess for what had then seemed to him sufficient reason—but which seemed more monstrous with each passing year and more unjustified with each new rigor of his chosen penance. Facing him, on the step below was a man in his mid-twenties. With his long blond hair, his soft, supple clothes that dripped with lace and screamed with edging and which gave him the appearance of a dandy, he might look soft and effeminate. No one who saw him would retain the illusion long and certainly not after seeing the feline leaps, the graceful falls, the seemingly careless lunges of his swordplay. He called himself Aramis and said he was merely sojourning in the Musketeers till he considered himself worthy of joining a monastical order. Indeed, only some years ago, as the young and naive Rene Chevalier D’Herblay, he’d been a seminarian in Paris, intent on taking the orders for which his pious mother had destined him from birth. But D’Herblay’s weakness was women. And unfortunately women showed the same propensity towards him. Which was why he’d been found reading the lives of saints to a lady of slightly less pure reputation than her family would wish. In the resulting duel he’d killed the lady’s brother. Because dueling was illegal, ever since then he’d been hiding in the Musketeers, under the name of Aramis. Now he climbed the stair, pressing his friend close, his thrusts so carefully aimed that they did no more than slit the fabric of Athos’s doublet. “You really must learn to cover your right,” he told Athos with a smile that might pass as a smirk. Athos frowned. Aramis smirked more widely. There was an excitement in taunting Athos. Aramis had known his friend long enough and seen him in close enough situations that he realized inside Athos there was as if a wild beast, looking out and snarling in fury and held in check only by Athos’s intellect and Athos’s conscience. There was the feeling that at any moment the control might slip loose and the beast escape the confinement of the well-trained nobleman. But not now, and not over a game. Instead, Athos smiled back, one of his rare smiles, this one tinged with the amusement someone might feel towards an impertinent child. He charged down the stairs, pressing Aramis close and making Aramis sweat in trying to parry all the thrusts. The rules of this game, as it was played by the corps of Musketeers—the best sword fighters in the reign of his Majesty Louis XIII of France—were that the first to be pressed all the way up the stairs to the landing in front of the door to the office of Monsieur de Treville, their captain, or the first one to be pushed all the way down the stairs and off the steps altogether would lose the game. The loss usually involved many jokes from all their comrades and, inevitably, a round of forfeited drinks stood by the loser and a round of celebratory drinks by the winner. Aramis had no intention of losing. He’d lost the last three times he’d played this game with Athos, and the one he’d played with Porthos. He’d not yet succeeded in challenging the cunning Gascon, D’Artagnan, to this pastime. The sly newcomer to their group had a way of smiling and ignoring the best taunts and challenges from the rest of them. Unnerving when it had been so easy to challenge him to a duel on his first day in Paris. One must conclude either that the Gascon had grown prudent—something as unlikely as a fish growing wings—or that he valued his purse higher than his life. This last was quite likely, particularly as his purse, like that of the rest of them, was so often empty. Aramis’s was not exactly brimming with coin just now, and he knew while he might be able to forgo paying for drinks as a winner by pleading poverty, he could never forgo paying the forfeited drinks to the winner and any hangers-on should he lose. And Athos could drink most men in Paris under the table, while showing no other sign of inebriation than a profound and growing melancholy. On this thought, Aramis found himself on the very last step of the stairs, defending himself ineptly with his sword held too close to his body, while Athos charged down the steps, his lips curled in that curious snarl-look they got when he was near claiming victory. Seeing Athos like this, always raised the question whether the musketeer would remember in time that this was a friendly game and stop himself from spearing his friend through. Aramis was fairly sure he would and yet he was not willing to lose the remaining content of his purse. Making use of his agility, which was his greatest asset in any duel, he made as if to leap down, then ducked under Athos’s sword arm and came at him from the other side, pushing Athos’s sword out of the way with his doublet-padded forearm, and physically forcing his friend to take three steps up hastily. This gave Aramis room enough to lope upwards two steps and reengage Athos in swordplay. All of it followed by the clink of coins that indicated bets were being made and paid by the mass of Musketeers down there, in the waiting room. Aramis tried to ignore them, as he concentrated on pushing Athos up yet another couple of steps, an intention that Athos resisted with his not inconsiderable skill at parrying. In a way these mock duels were harder than the real duels, where Aramis could simply have tried to thrust his sword through his opponent’s heart. But he would never injure Athos, or not voluntarily. Together, Athos, Aramis, Porthos and even the newcomer, D’Artagnan, had dueled and bled. Their friendship had been cemented by a hundred instances of mutual defense, a thousand shared secrets. They could no more kill each other than they could commit suicide. One would feel much like the other at any rate. And not killing Athos while forcing him up the steps was harder than it would have been to kill just about anyone. After all, they’d practiced and fought together so long, each knew the other very well and every move could be anticipated. It was easiest of all to fight each other to a standstill. To get through, Aramis must block every thought and move that didn’t have to do with sword and footwork, and the unyielding body in front of him . . . He must forget it was Athos. Only remember he must not kill him. He must . . .
With swords clashing, in the sound of metal, and, with their swords gripped between them and held upright, with too little room to move, Aramis pressed forward with his body, forcing Athos up one step, two, another . . . Very quickly. And then Athos recovered his balance. And on that balance came the ineluctable fact that Athos weighed more than Aramis—his rather solid mass of muscle and bone still looked lean enough but was by far more hefty than Aramis’s gracile figure. Once Athos had firmly planted his feet, Aramis could not budge him. From his voice, it was hard to tell whether it was a taunt or he truly meant for Aramis to forfeit the game and concede defeat, even though the younger musketeer was nowhere near losing. From Athos’s maddened dark blue eyes, too, it was hard to tell if he even remembered what humor was. “Well,” Athos said. “Then I have no choice but to make sure you lose.” And on that the larger musketeer gave his friend a shove. He turned, without even thinking. He turned, half ready to scold Porthos for interrupting him at his game, and then he saw Porthos. The huge redhead whose ancestors, doubtless, had come to the coasts of France in long ships, was not dressed in the style in which he usually permitted himself to appear in public. That was the first thing strange about it all, because Porthos was vain as a peacock and his normal attire in public was twice as bright as any bird’s plumage. Aramis could not remember his friend ever having appeared in public in this attire of worn linen breeches and a tunic that looked like a beggar would disdain it. No. Aramis had seen Porthos in these clothes, but only in the practice room, in the privacy of Porthos’s own lodgings. In the normal course of things, Porthos would rather— much rather—die than be seen in public in this shabby a display. But, worse, the face above the clothes looked like Porthos had already died. Pale and bloodless, with a grayish tinge to the lips, Porthos’s skin made his eyes look unnaturally bright, his hair and beard a screaming scarlet stain. “Porthos,” Aramis said. And thinking no more of his duel or his potential forfeiting of money to buy enough drinks to fill the Seine—or satisfy Athos—he jumped over the elaborate railing of the staircase and landed, sword still in hand, in a hastily cleared space in the hall below. Too late he realized he had probably forfeited the contest and was not reassured by the sound of Athos’s landing on the mosaic floor behind him. Not reassured as far as losing the contest, but at least reassured by Athos’s support. He heard Athos sheathe his sword and remembered to sheathe his own. The crowd was parting between him and Porthos. Though they were all Musketeers, battle hardened and ready to defend themselves against many foes, few had the body to obstruct Porthos’s progress. The sheer bulk of Porthos would clear the way. And few of them would stand in front of Athos or Aramis either. So as the crowd melted away and pressed out of their path, on either side of the room, Aramis and Athos met with Porthos. Porthos was silent—which in itself was strange after demanding their attention so forcefully. He looked from one to the other of them, and then at the staircase and the railing over which Aramis had jumped. He frowned, as though trying to make sense of something particularly difficult. “Sorry I interrupted your game,” he said. “Who is dead, who?” Aramis asked, his impatience tempered by concern. He would easily have been the first to admit that his friend was inarticulate and had a difficult time expressing himself. But today Porthos seemed inarticulate even for himself. As if he were in shock. And why would Porthos be in shock at someone’s death? Death was their profession and their companion, walking by their side night and day. Apprentice? Frowning, unable to understand of what Porthos spoke, Aramis realized that other Musketeers were listening in on their conversation and that a hushed silence had fallen in the room. 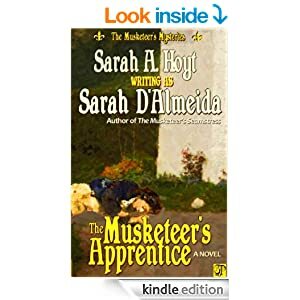 Aramis turned to see a musketeer—who had been in conference with the captain—skulk down the stairs. At the top of the stairs Monsieur de Treville stood, glaring down at them. Though he was as olive skinned and as short as their friend D’Artagnan, who came up barely to Aramis’s shoulder and no more than to Porthos’s chest, there was not a man in the room that wouldn’t swear Monsieur de Treville was at least twelve feet tall. And each and every one of them would have allowed himself to be—cheerfully—cut into ribbons for the captain. Without a word, Aramis turned to obey. And found that Athos was already ahead of him, running up the stairs. But he had to reach for Porthos’s arm and pull before the giant musketeer realized he must obey. That he hadn’t jumped to the captain’s order meant something was very wrong indeed.